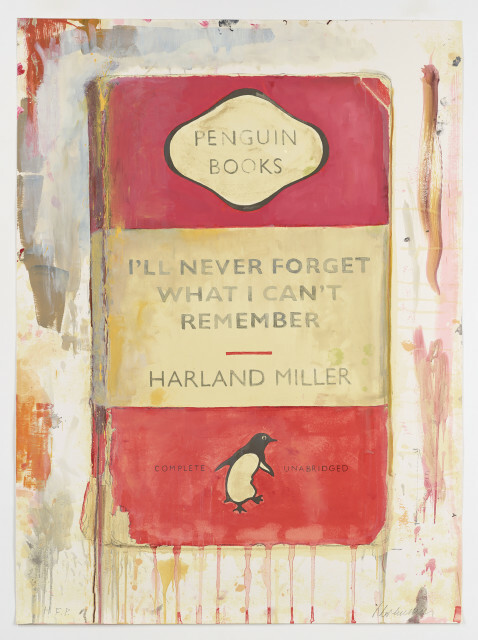 Harland Miller is both a writer and artist (his debut novel Slow Down Arthur Stick to Thirty was published in 2000) and his paintings of books simultaneously provide a subject for the painter and an outlet for the writer. They combine the emotive possibilities of abstract expressionism with the quick punch of words to deliver their message, and for all the macho grist of their making, and often overwhelming scale, they somehow express a frailty that hints at the human condition. As Miller has said: “Painting is the worst medium to express narrative, but perhaps the best to hit a nerve”. Harland Miller was born in Yorkshire in 1964. He has lived in New York and Berlin and currently lives and works in London. In late 2012, Miller had his first solo show at Ingleby Gallery entitled Overcoming Optimism.